An Orchid flower blooms beautifully. It looks attractive most in the flowering phase. Carnations are referred as the “flowers of God”. 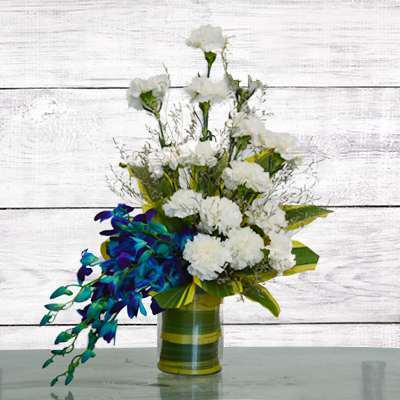 The amazing blend of these two flowers makes for a heavenly gift for your loved ones. The beautiful purple 6 purple orchids and 20 yellow carnations are placed in a designer glass vase to spellbind your loved ones.